David Camoron is going to the European Empire today to fight for a limit on the increase in the EU budget. A few days ago he wanted a freeze in the budget and a few days before that he wanted a reduction in the budget. By the end of the day he'll have increased our contribution and agreed to abolish the rebate. It is impossible for the UK government to reduce the EU budget. Even if Camoron somehow managed to get a majority of the heads of member states to agree to limit the obscene 6.2% increase in the EU budget, the EU Parliament can overrule them and as we all know, 90% of the EU Parliament is made up of europhile traitors whose only objective in life is lining their own pockets and creating a European Empire. Cast Iron Dave gave a cast iron promise that we would have a referendum on the Lisbon Treaty/EU constitution. He lied. He said his government wouldn't transfer any more powers to the EU and then transferred more criminal justice powers to the EU, agreed to illegal EU scrutiny of the UK budget before it goes to Parliament and agreed to the creation of an EU financial services regulator. He lied. He said he would fight for a reduction in the EU budget. He lied. He said he would fight for a freeze in the EU budget. He lied. He says he's going to fight for a limit on the EU budget increase. He's lying! France and Germany want to change the Lisbon Treaty/EU constitution to give the EU more control over eurozone economies. Camoron said any new treaty or treaty change would be subject to a referendum. Now he says we don't need a referendum on this change to the Lisbon Treaty because we're not in the euro. Another lie. David Camoron is a compulsive liar and a treasonous europhile. He has surrounded himself with europhile Tories and Lib Dems in his ConDem coalition cabinet. 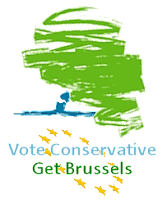 During the election campaign we said "Vote Conservative, get Brussels". 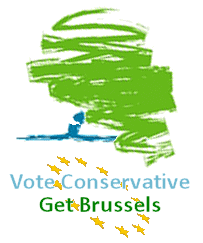 The electorate voted Conservative and they're getting Brussels. I may have mentioned this before but a real pet hate of mine is when people call the EU "Europe". They are not different words for the same thing. Watching the One Show on BBC1 tonight, they started talking about the European Arrest Warrant and the case of a young man extradited to Greece and currently stranded there, unable to leave the country, while he waits for a trial to answer assault charges. Except it's not the European Arrest Warrant, it's the EU Arrest Warrant. The history revisionists in Brussels want to plaster "monuments, memorial sites, and places of remembrance" with blue plaques to commemorate their imaginary contribution to the imaginary shared values and imaginary shared history and culture of the European Empire. I won't even go there otherwise I'll be up all night ranting at my keyboard instead of sleeping and Gawain has already done the honours in his usual concise and scathing way. But I will have a little rant about the name of the plaques - the European Heritage Label. Aaaargh! EU Heritage Label, not European! 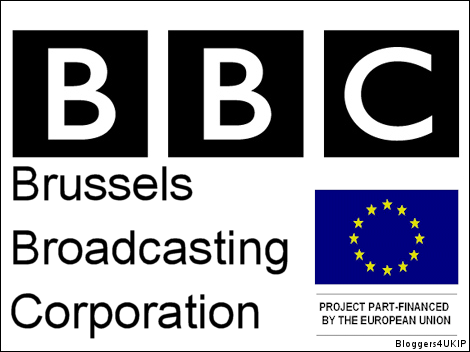 The BBC has a habit of calling the EU "Europe". The British government does it as well with its Europe Minister and Europe Office, neither of which have a remit outside of the EU. 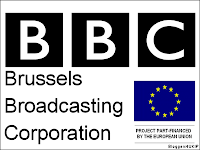 I've put in a complaint to the BBC about them calling the EU "Europe" and pointing out that they have an obligation to accurately report on the EU. It won't make the slightest bit of difference but it made me feel better. The European Empire has despatched Rapid Border Intervention Teams to try and seal the Greece-Turkey border because Greece can no longer cope with the number of illegal immigrants making their way in from Turkey. According to the EU's own border control quango, Frontex, 90% of illegal immigrants caught trying to get into the European Empire were coming over the Greece-Turkey border. The Greek government has asked the EU to send in Rapid Border Invention Teams because they can no longer deal with the influx of asylum seekers. There is a backlog of 52,000 asylum claims in Greece that have yet to be dealt with. If the European Empire can't cope with the 350 illegal immigrants who enter Greece every day, how are they going to cope with the 74 million Turks who will have the right to live and work anywhere in the European Empire if and when Turkey eventually joins the EU gravy train? Millions of Turks will make their way into the EU via Greece, putting an intolerable strain on every member state but particularly Greece and Bulgaria as the gateway to the Ægean. David Campbell Bannerman complained to the BBC about Nigel Farage's planned appearance on Question Time and had him pulled from the programme. Tim Congdon chipped in and said it wasn't fair for Farage to appear on TV when the other leadership candidates didn't. So where was Tim Congdon last Sunday? On the BBC Politics Show without any of the other candidates. His justification for appearing on the Politics Show when he said it was unfair for Farage to appear on Question Time? Because he announced that he was going to be on the show and none of the other candidates complained so they obviously didn't mind. Why DCB decided not to complain about Tim Congdon appearing on the BBC is a mystery, especially considering that he made the announcement at the same leadership hustings that Farage did about Question Time. One rule for Farage, one rule for everyone else it seems. Just a quick reminder that today is the last day to enter our competition to win a signed copy of Nigel Farage's book, Fighting Bull. Any posts submitted by anyone other than me from the 1st of October until the end of today can be entered into the competition to win the book. Nigel Farage will judge the posts entered into the competition and the one he judges to be best will receive a signed copy of the book. If you want to take part in the competition but haven't been set up to write for the blog yet, you can contact me. I can't guarantee I'll pick up your message in time but I'll do my best! So imagine everyone's surprise when Nigel got a phone call from the press office following the hustings telling him that the BBC had removed him from the panel on tomorrow's Question Time programme because David Campbell Bannerman had complained that they were giving him airtime during the leadership election. Tomorrow's Question Time is about the huge new wind farm at Thanet which UKIP is opposing, not about the leadership election. Nigel would have been to token anti-windmill panel member and was chosen ahead of a Green Party spokesman. Now UKIP will be denied the publicity that Question Time always brings and the programme will probably go ahead without someone credible speaking out against the global warming scam. So much for party loyalty. But loyalty to members and the cause is more important than loyalty to the party and that's why DCB is even more out of order in making this petty complaint. While the other candidates were chatting to members, listening to their views and giving them more detail on their campaigns, DCB was in the car park complaining to the BBC. DCB started the hustings with a personal attack on Farage and finished with an attack on Farage. Another own goal from Team DCB. The First Past The Post system is one which needs to be put out of its misery, killed, finished. It is hopelessly outdated in an era where many constituents don't need to live down the road from their MP to be able to contact them and follow their work thanks to the advent of the internet. It is also hopelessly unrepresentative, as illustrated by the last General Election where much smaller parties got MPs, while UKIP with nearly 1,000,000 votes still has zero representation in the House of Commons. It would be logical for me then to vote "yes" to the Alternative Vote in next year's referendum, yes? Well hang on. AV is a preferential system, not a proportional one. On the other hand, those who seem to be running the "no" campaign seem to be largely Conservative advocates of FPTP. I am in neither of these camps. I don't like AV and I don't like FPTP. So the question I have to ask is, would a "yes" vote open up the flood gates and make the possibility of further PR reform possible, or would it simply serve politicians to turn around and say "job done, PR secured"? Would it effectively be used to kill off the argument for full PR, as it would have supposedly been secured? On the other hand, a "no" vote against AV will be used many to justify the view that their is no wide appetite among the British public for electoral reform or proportional representation. It could set the case for those who want genuine PR back many years again. Which camp am I in? I'm still not quite sure, and I doubt I'm alone. What absolute and complete nonsense Hague is coming out with nowadays. He says that he will bind future governments to hold referenda on transfers of sovereignty to the EU; but in the same breath says that parliament cannot be bound! A future government can change his bill with no reference to the public, so removing the requirement for a referendum, or can simply deny that any transfer of sovereignty is taking place. Remember Labour reneged on a manifesto pledge for a referendum by deny that the Lisbon Treaty transferred any power to the EU - according to Labour it was 'just a tidying up exercise', while to all others it was the EU Constitution under another name. Hague forfeited any remaining credibility he had with his 'there is no treaty to have a referendum on' comment. Just a reminder about the competition to win a signed copy of Nigel Farage's book, Fighting Bull. Any posts submitted from today until the 22nd of October can be entered into a competition to win a signed copy of Fighting Bull. Nigel Farage will judge the best entry and the winner will receive the book. After the closing date I will contact everyone who has written for Bloggers4UKIP in the month of October and invite them to choose the post they would like to submit. Depending on the number of entries, you may get to nominate a second post. The competition is open to anyone (except me) who publishes a post on Bloggers4UKIP between the 1st and 22nd of October. If you aren't already set up to write for Bloggers4UKIP, you can contact me to get yourself set up.